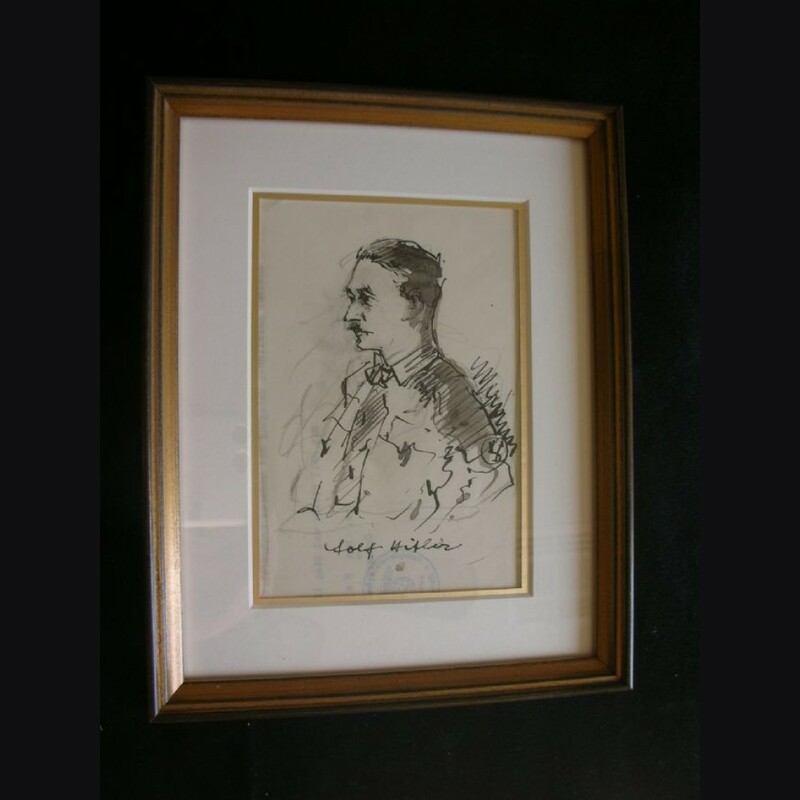 Small format original artist sketch of Adolf Hitler by noted artist Albert Reich. Reich was responsible for illustrations, postcards, and period artworks before the war and during the 3rd Reich. Also responsible for designing the original cover art for Mein Kampf and a personal friend and biographer of Dietrich Eckart he had close ties to Adolf Hitler and hierarchy and inner circle. This piece measures about 7 3/4 x 9 3/4 and is done in both ink and watercolor paint, the artist did this on the back of a letter from the NSDAP and you can see some lettering and the watermark to the rear. This did give me a little pause at first but in the finished product it actually adds to the piece as what it is. This and all the examples I will offer in this section are conservation framed with acid free backing, proper UV glass and no shortcuts are taken and they are really nice. Albert Reich (1881-1942) a long time artist prior to the rise of National Socialism and from Bavaria was at work in WWI and did both military themed pieces and non military themed pieces. Most of his work is military in nature and depicts normal military type themes. From the German Alpenkorps in WWI to illustrations for S.A publications and postcards during the Reich. His works were displayed 11 times in the Great German Art Exhibition with some noted here with several purchased by Adolf Hitler for several thousand Reichmark: "Artillerie geht an die Frontâ€, "Bayerische Artillerie in Flandernâ€, "Batterie in Polenâ€, "DÃ¼nkirche, versenkte Schiffeâ€, "Vormarsch des VII-Armeekorpsâ€, etc. Reich went on to be a combat artist in Poland in1939 before his death in 1942.